It is generally a good practice to separate your Django projects into multiple specialized (and sometimes reusable) apps. Additionally every Django model must live in an app so you’ll need at least one app for your project. We’ll be focusing on the models.py file below. Before we can use our app we need to add it to our INSTALLED_APPS in our settings file (myblog/settings.py). This will allow Django to discover the models in our models.py file so they can be added to the database when running syncdb. First let’s create a blog entry model. Models are objects used to interface with your data, and are described in the Django model documentation. This will correspond to a database table which will hold our blog entry. A blog entry will be represented by an instance of our Entry model class and each Entry model instance will identify a row in our database table. If you aren’t already familiar with databases, this code may be somewhat daunting. A good way to think about a model (or a database table) is as a sheet in a spreadsheet. Each field like the title or author is a column in the spreadsheet and each different instance of the model – each individual blog entry in our project – is a row in the spreadsheet. If you notice, this code is written in a very particular way. There are two blank lines between imports and class definitions and the code is spaced very particularly. There is a style guide for Python known as PEP8. A central tenet of Python is that code is read more frequently than it is written. Consistent code style helps developers read and understand a new project more quickly. We don’t want to manually add entries to the database every time we want to update our blog. It would be nice if we could use a login-secured webpage to create blog entries. Fortunately Django’s admin interface can do just that. Now, start up the development server again and navigate to the admin site (http://localhost:8000/admin/) and create a blog entry. First click the “Add” link next to Entries in the admin site. Next fill in the details for our first blog entry and click the Save button. In the admin change list our entries all have the unhelpful name Entry object. We can customize the way models are referenced by creating a __unicode__ method on our model class. Models are a good place to put this kind of reusable code that is specific to a model. Let’s first create a test demonstrating the behavior we’d like to see. If we read the output carefully, the manage.py test command did a few things. First, it created a test database. This is important because we wouldn’t want tests to actually modify our real database. Secondly, it executed each “test” in blog/tests.py. If all goes well, the test runner isn’t very chatty, but when failures occur like in our test, the test runner prints lots of information to help you debug your failing test. Now we’re ready to create a real test. There are lots of resources on unit testing but a great place to start is the official Python documentation on the unittest module and the Testing Django applications docs. They also have good recommendations on naming conventions which is why our test classes are named like SomethingTest and our methods named test_something. Because many projects adopt similar conventions, developers can more easily understand the code. __unicode__ may seem like a strange name, but Unicode is a standard for representing and encoding most of the world’s writing systems. All strings that Django passes around are Unicode strings so that Django can be used for applications designed for different languages. Our test fails again, but this time it fails because we haven’t customized our __unicode__ method yet so the unicode representation for our model is still the default Entry object. If you start the development server and take a look at the admin interface (http://localhost:8000/admin/) again, you will see the entry titles in the list of entries. We’ve just written our first test and fixed our code to make our test pass. Test Driven Development (TDD) is all about writing a failing test and then making it pass. If you were to write your code first, then write tests, it’s harder to know that the test you wrote really does test what you want it to. While this may seem like a trivial example, good tests are a way to document the expected behavior of a program. A great test suite is a sign of a mature application since bits and pieces can be changed easily and the tests will ensure that the program still works as intended. The Django framework itself has a massive unit test suite with thousands of tests. 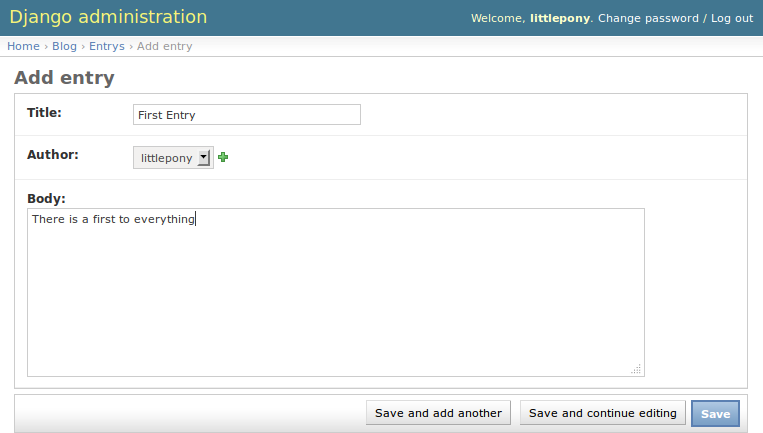 Did you notice that the pluralization of entry is mispelled in the admin interface? “Entrys” should instead read “Entries”. Let’s write a test to verify that when Django correctly pluralizes “entry” to “entries”. This test uses the model _meta class (created based on the Meta class we will define). This is an example of an advanced Django feature. The _meta class is currently undocumented. Now let’s make our test pass by specifying the verbose name for our model. See the Django documentation for information on verbose_name_plural in the Meta class.